Most people expect that our signal of an impending reduction in world oil or coal production will be high prices. Looking at historical data (for example, this post and this post), this is precisely the opposite of the correct price signal. Oil and coal supplies decline because prices fall too low for producers. These producers make voluntary cutbacks because the prices they receive fall below their cost of production. There often are supply gluts at the same time. (1) Prices producers require tend to rise over time, because of depletion. The easiest to extract portion of any resource (such as oil, coal, copper, or lithium) tends to be removed first. What is left tends to be deeper, lower quality, or otherwise more difficult to extract cheaply. Wages of many workers fall because of competition from lower cost labor in other countries. Some jobs are eliminated through the use of computers or robots. Young people are increasingly being required to pay for higher education (beyond that which is provided free), leaving many with loans to repay, reducing their discretionary income. Changes to US healthcare law (mostly starting January 1, 2014) lead to required health insurance premiums. While some citizens find cost savings in this approach, healthy young people often experience cutbacks in discretionary income as a result. Rents and home prices keep rising faster than incomes. Almost everyone seems to believe that our energy problems are primarily oil-related. Electricity will save us. I recently gave a talk to a group of IEEE electricity researchers (primarily engineers) about the current energy situation and how welcoming it is for new technologies. Needless to say, this group did not come with the standard mindset. They wanted to understand what the electricity situation really is. They are very aware that intermittent renewables, including wind and solar, present many challenges. They didn’t come with the preconceived notion that oil is the problem and electricity will save us. It wasn’t until I sat down and looked at the electricity situation that I realized how worrying it really is. Intermittent wind and solar cannot stand on their own. They also cannot scale up to the necessary level in the required time period. Instead, the way they are added to the grid artificially depresses wholesale electricity prices, driving other forms of generation out of business. While intermittent wind and solar may soundsustainable, the way that they are added to the electric grid tends to push the overall electrical system toward collapse. They act like parasites on the system. 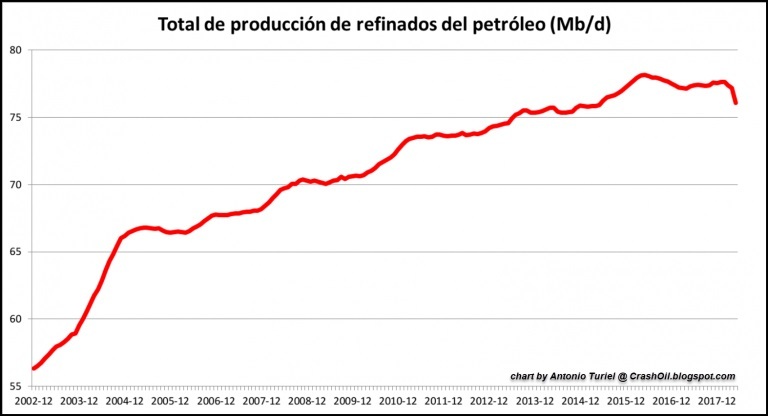 In a recent post, Antonio Turiel proposed that the global peak of diesel fuel production was reached three years ago, in 2018. Turiel’s idea is especially interesting since it takes into account the fact that what we call “oil” is actually a wide variety of liquids of different characteristics. 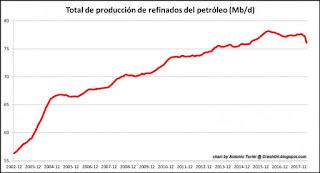 The current boom of the extraction of tight oil (known also as “shale oil”) in the United States has avoided, so far, the decline of the total volume of oil produced worldwide (“peak oil”). Shale oil has changed a lot of things in the oil industry, but it couldn’t avoid the decline of conventional oil. That, in turn, had consequences: shale oil is light oil, not easily converted to the kind of fuel (diesel) which is the most important transportation fuel, nowadays. That seems to have forced the oil industry into converting more and more “heavy” oil into diesel fuel but, even so, diesel fuel is becoming gradually more scarce and more expensive, to the point that its production may have peaked in 2015. In addition, it has created a dearth of heavy oil, the fuel of choice for marine transportation. In short, the famed “peak oil” is arriving not all together, but piecemeal — affecting some kinds of fuels faster than others. Turiel’s proposal has raised a considerable debate among the experts, with several of them challenging Turiel’s interpretation. Turiel himself and Gail Tverberg (of the “our finite world” blog) discussed the validity of the data and their meaning. Below, I reproduce the exchange with their kind permission. As you will see, the matter is complex and at the present stage it is not possible to arrive at a definitive conclusion. In recent years, we have heard a great deal about the possibility of Peak Oil, including high oil prices. If the issue we are facing is really prices that are too low for producers, then there seems to be the possibility of a different limits issue, called Collapse. 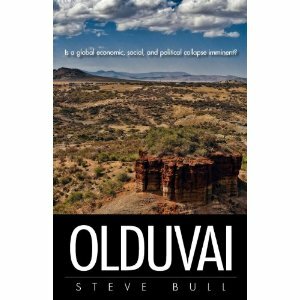 Many early economies seem to have collapsed as they reached resource limits. I will be giving a presentation to a group of casualty actuaries on September 17 called “The World’s Fragile Economic Condition.” I plan to write up the presentation in two posts, one covering the first three of the six sections of the presentation, and the second one covering the second three sections, so that it is easier to read online. I am putting up a link now to the presentation, to allow those who want to look at the presentation now, a chance to do so. This presentation pulls together quite a few things I have been talking about. It also adds a new model of how our self-organizing economy works. Many people expect energy shortages to lead to high prices. 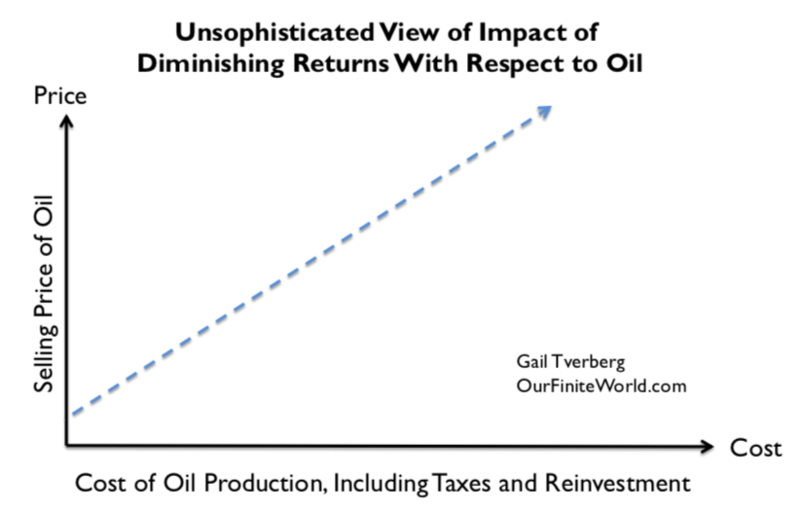 This is based on their view of what “running out” of oil might do to the economy. In this post, I look at historical data surrounding inadequate energy supply. I also consider some of the physics associated with the situation. I see a strange coincidence between when coal production peaked (hit its maximum production before declining) in the United Kingdom and when World War I broke out. There was an equally strange coincidence between when the highest quality coal peaked in Germany and when World War II broke out. 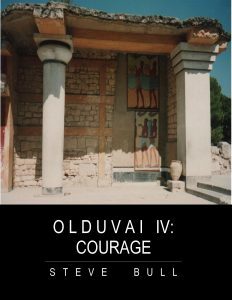 A good case can be made that inadequate energy supply is associated with conflict and fighting because leaders recognize how important an adequate energy supply is. 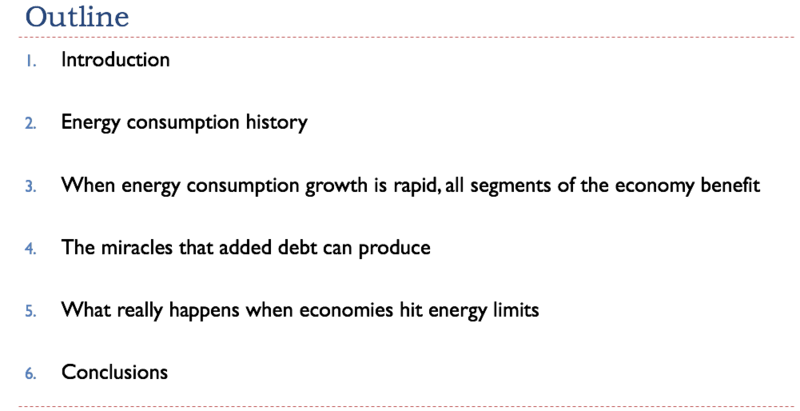 The physics of the low energy situation may be trying to “freeze out” the less efficient portions of the economy. 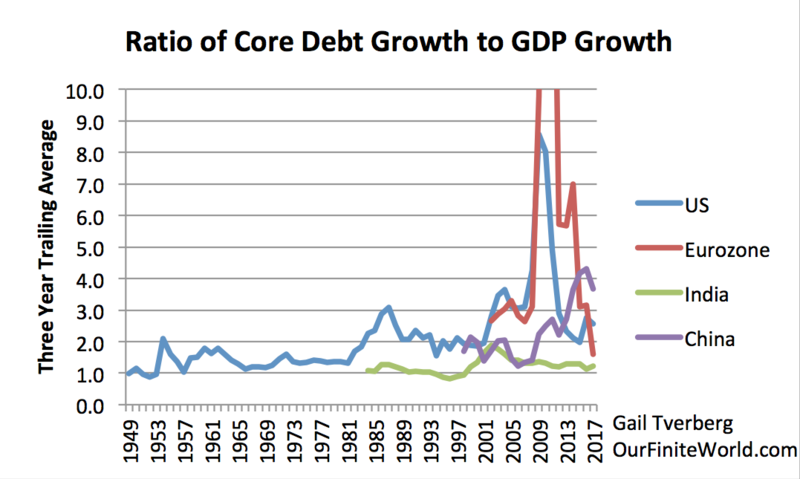 If successful, the outcome might be analogous to the collapse of the central government of the Soviet Union in 1991, after oil prices had been low for several years. Total energy consumption of countries involved in the collapse dropped by close to 40%, on average. The rest of the world benefitted from lower oil prices (resulting from lower total demand). It also benefitted from the oil that remained in the ground and consequently was available for extraction in recent years, when we really needed it. Energy is a subject that is greatly misunderstood. Its role in our lives is truly amazing. We humans are able to live and move because of the energy that we get from food. We count this energy in calories. Green plants are also energy dependent. In photosynthesis, plants use energy from the sun to convert carbon dioxide and water into the glucose that they need to grow. Ecosystems are energy dependent as well. The ecologist Howard T. Odum in Environment, Power, and Society explains that ecosystems self-organize in a way that maximizes the useful energy obtained by the group of plants and animals. 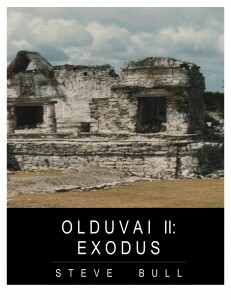 Economies created by humans are in some respects very similar to ecosystems. They, too, self-organize and seem to be energy dependent. The big difference is that over one million years ago, pre-humans learned to control fire. As a result, they were able to burn biomass and indirectly add the energy this provided to the food energy that they otherwise had available. 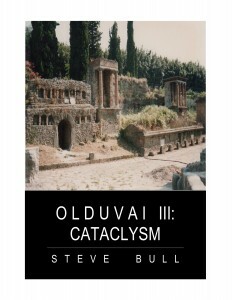 The energy from burning biomass was an early form of supplemental energy. How important was this change? James C. Scott, in Against the Grain, explains that being able to burn biomass was sufficient to turn around who was in charge: pre-humans or large animals. In one cave in South Africa, he indicates that a lower layer of remains found in the cave did not show any carbon deposits, and hence were created before pre-humans occupying the cave gained control of fire. In this layer, skeletons of big cats were found, along with scattered gnawed bones of pre-humans. The world is making limited progress toward moving away from fossil fuels. The two bands that top fossil fuels that are relatively easy to see are nuclear electric power and hydroelectricity. Solar, wind, and “geothermal, biomass, and other” are small quantities at the top that are hard to distinguish. Figure 1. 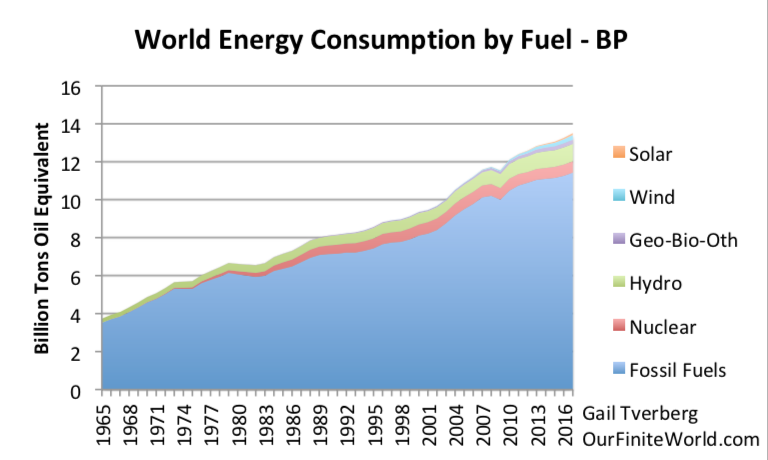 World energy consumption divided between fossil fuels and non-fossil fuel energy sources, based on data from BP 2018 Statistical Review of World Energy 2018. Wind provided 1.9% of total energy supplies in 2017; solar provided 0.7% of total energy supplies. Fossil fuels provided 85% of energy supplies in 2017. We are moving away from fossil fuels, but not quickly. Of the 252 million tons of oil equivalent (MTOE) energy consumption added in 2017, wind added 37 MTOE and solar added 26 MTOE. Thus, wind and solar amounted to about 25% of total energy consumption added in 2017. Fossil fuels added 67% of total energy consumption added in 2017, and other categories added the remaining 8%. 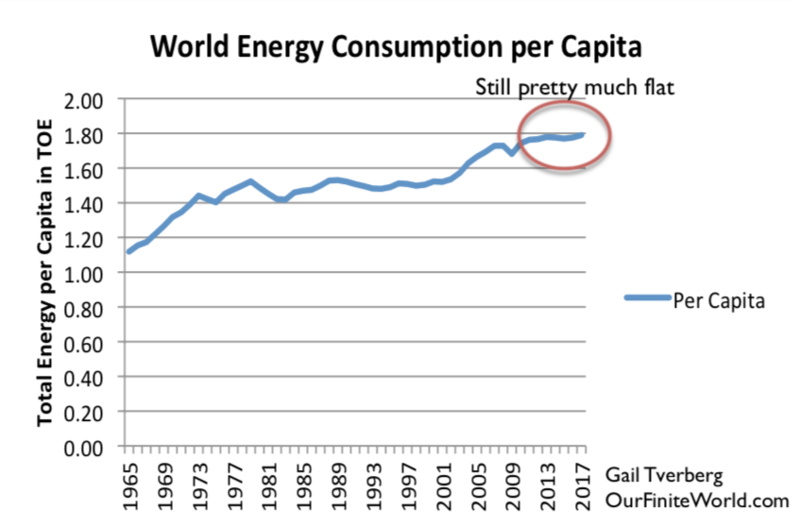 World per capita energy consumption is still on a plateau. In recent posts, we have remarked that per capita energy consumption seems to be on a plateau. With the addition of data through 2017, this still seems to be the case. The reason why flat energy consumption per capita is concerning is because oil consumption per capita normally rises, based on data since 1820.1 This is explained further in Note 1 at the end of this article. Another reference is my article, The Depression of the 1930s Was an Energy Crisis. Figure 2. World energy consumption per capita, based on BP Statistical Review of World Energy 2018 data. 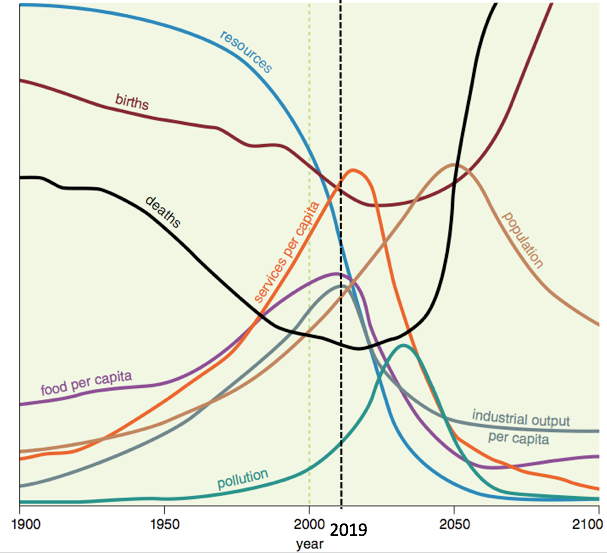 While total energy consumption is up by 2.2%, world population is up by about 1.1%, leading to a situation where energy consumption per capita is rising by about 1.1% per year. This is within the range of normal variation.